Today, Governor David Ige issued a statement urging lawmakers to pass HB1326 HD2, a bill that extends temporary permits for access to water to 13 permit holders. Four of those permits, held by Alexander & Baldwin, were invalidated by a circuit court ruling in 2016. Passing HB1326 HD2 would allow A&B to circumvent the court ruling and retain $62 million from the sale of their central Maui sugar plantation to Mahi Pono. We are deeply disappointed in Governor Ige’s decision to use the power of his position to pressure lawmakers to pass a version of HB1326 that guarantees A&B retains $62 million in profit from East Maui’s public stream resources. We went to the Governor’s office yesterday in good faith to collaborate on a proactive path forward for small water users based on existing legal authority. The Governor betrayed that good faith with a statement that attempts to influence lawmakers to change a decision that has already been made, attempts to justify sidestepping a court ruling, and specifically names the opponents of the bill that he met with but not the supporters. This crisis is manufactured. The Ige Administration was granted a three year extension on the issuance of these revocable permits in 2016, immediately after the circuit court decision in the Carmichael case was issued. In that three years, DLNR did not propose any fixes to Haw. Rev. Stat. §171-58, did not adopt regulations to clarify their implementation of this statute, or otherwise actually attempt to solve this problem. DLNR staff did continue to renew holdover permits, and issued a letter to the 9 other revocable permit holdovers that only served to fuel concern for their future access to water. Sold its defunct sugar plantation to Mahi Pono for $262 million. The contract for that land sale makes clear that if the new buyer does not have guaranteed access to 30 million gallons of water a day from East Maui streams through 2026, then A&B will return $62 million to the new buyer. HB1326 HD2 would extend A&B’s current four temporary water permits through 2026 with zero recourse for the residents of East Maui. Governor Ige’s statement fails to acknowledge the legal responsibilities of his Administration to protect public trust resources from exploitation. This is an obligation that has been repeatedly upheld by Hawaiʻi’s highest court of law. Instead his statement feigns fairness by claiming to support equal treatment for all permit holders. Yet, the different entities relying on these permits for access to public water resources are not all the same. Of the 13 permits at issue, four are held by A&B, arguably one of the most powerful and influential corporations in the Hawaiian Islands. The four permits held by A&B have been invalidated by a court of law, and that decision is on appeal. The remaining 9 permits are held by two utilities operating hydroelectric power plants, and seven smaller entities and individuals watering crops and animals. None of these 9 permits have been challenged in a court. After 6 hours of verbal testimony, hundreds of calls and emails from constituents, and over 600 written testimonials received in opposition to HB 1326 HD2, the Senate Water and Land Committee, chaired by Senator Kaialiʻi Kahele, crafted a version of this bill that addressed the perceived needs of the small water users and utilities, while respecting the judicial process. If Governor Ige were truly interested in helping small water users, and not advancing the special interests of A&B, then he should have made a statement in support of that bill. Unfortunately, he did not. At least now everyone knows where he stands in regards to the last of the Big 5 companies that once dominated the Hawaiian Islands. The Ige Administration has all the legal authority it needs to provide access to public trust water resources. It is time to DLNR to take seriously its responsibility to protect the public’s natural resources from exploitation. **SB 223 currently transfers portions of the East Kaua‘i irrigation system from the East Kaua‘i Water Users Cooperative to the Dept. of Agriculture and provides a two-year extension for the Cooperative’s stream diversion works permit. There may be other potential options not on this list and we will be monitoring hearings and floor sessions to ensure our legislators don’t resurrect HB 1326 HD2 in any form. Legislative session ends on May 2nd- it’s not over until it’s over. Thank the Senators for doing the right thing! HB 1326 back from the dead! Email the senate TODAY! We need to act now! A&B’s senators are pulling out extraordinary measures to pass A&B’s preferred version of the HB1326, which would allow them to continue to divert streams for seven more years and retain $62 million from the sale of their land. ICYMI: Thursday, in decision making in its joint hearing in the Senate Committees on Water and Land and Ways and Means, HB 1326—the “Water Theft Bill” was killed… but now it’s possible it’s a zombie and it’s coming back. Click here to take action. HB 1326 was heard in its joint WTL/WAM hearing on Tuesday, April 2. After more than 6 hours of testimony—majority in opposition, only 2 in support, and over 700 written testimony submitted—604 against, 100 comments and 40 in support, members of the committees moved to defer decision making until Thursday, April 4th. Thursday, WTL Chair Kahele introduced an amended bill that would cut out A&B—essentially stopping them from receiving any more extensions on their temporary permits to divert water, while also ensuring that small ranchers and farmers would have access to the water they need. WTL voted 3-2 to pass the amended version (Sen. Kahele, Riviere, and Nishihara in favor; Sen. Fevella and Keith-Agaran against; Sen. English absent). We knew it was possible the bill could come back from the dead, we just didn’t know exactly how. Now we know that A&B’s senators are working to get enough votes to bring HB 1326 to the floor. If A&B’s senators are successful in bringing the bill to the floor, then they will need 13 votes to pass the measure. They will be voting on HB1326 HD2. This is the version that passed over from the House (7-year extension to A&B and farmers), not the version with Sen. Kahele’s thoughtful amendments (3-year extension to only farmers, conditions on DLNR). This is because WAM deferred the bill before they voted on it, so it was not fully amended by the joint committee. If HB1326 HD2 passes the Senate floor vote, then it will go directly to the Governor for signature. It will bypass the House because HB1326 HD2 is the exact same bill the House already passed out. Which brings us to… ALL HANDS ON DECK. Let’s flood the senators’ inboxes, asking them to vote down this zombie bill once and for all. Click here to email all 25 senators, urging them to not favor A&B’s financial interests over the best interests of the streams and the people. We need our senators’ to VOTE NO on HB 1326 HD2. Click here to take action. THEN MEET US AT THE CAPITOL ROTUNDA TUESDAY 4/9 AT 9:30am TO RALLY TO FREE THE STREAMS! A Senate committee Thursday killed a bill that would have allowed an assortment of utilities, landowners, ranchers and farmers to continue accessing public water under revocable permits while they worked to satisfy stringent state requirements for obtaining long-term leases. The move by Sen. Donovan Dela Cruz, who chairs the Senate Ways and Means Committee, jeopardizes the continuation of hydroelectric plants on Kauai and Hawaii island, as well as ranchers’ access to water for cattle operations, while also satisfying staunch critics of Alexander &Baldwin, which was allowed by the state to divert hundreds of millions of gallons of water annually from streams in East Maui for its sugar cane operations. It’s not clear why Dela Cruz shelved the bill. But Sen. Kai Kahele, chairman of the Water and Land Committee, who tried to amend the bill Thursday to allow all users except for A&B to maintain their water use, said it could be “catastrophic” for small ranchers and farmers. The bill had sparked strong opposition from groups such as the Native Hawaiian Legal Corp. and Hawaii Sierra Club which argued it benefited A&B to the tune of $62 million. A&B recently sold extensive tracts of land in Central Maui to Mahi Pono LLC, a farming venture that is hoping to replace the company’s former sugar cane fields with diversified agriculture. A&B stands to lose $62 million if water to the land is disrupted, according to the sale agreements. Opponents argued that A&B was essentially trying to profit off of public-trust water resources and labeled House Bill 1326 the “water theft bill.” The Native Hawaiian Legal Corp., on behalf of taro farmers and other residents of East Maui, spent nearly two decades battling A&B over its water diversions. Dela Cruz’s decision to shelve the bill came as a shock to people who packed a hearing room in the state Capitol on Thursday afternoon for a joint hearing before the Senate Ways and Means Committee and Senate Water and Land Committee. Kahele had just put forward a proposed compromise. The Board of Land and Natural Resources could continue allowing entities to access public water under short-term revocable permits, unless those permits or water rights had been prohibited or invalidated by the courts. The compromise meant all the water users could continue having their permits renewed annually, except for A&B. In 2016 an Oahu Circuit judge invalidated A&B’s permits that allowed them to divert East Maui stream water, saying that the temporary permits, which dated back years, shouldn’t have been renewed annually. Hawaii law stipulates that water permits should not be extended beyond a year. The ruling, which is under appeal, highlighted problems with all of the department’s water permits. In addition to A&B, others accessing water under the short-term permits include Kuahiwi Ranch, East Kauai Users Cooperative, Hawaii Electric Light Co., Kapalala Ranch, Kauai Island Utility Cooperative, Jeffrey Linder, Edmund Olsen Trustee and Wood Valley Water &Farm Cooperative. In 2016, in response to the court ruling, A&B and other water users successfully lobbied legislators to pass Act 126, which gave them three years to convert their water permits into leases. But that end-of-the-year deadline is now fast approaching, and none of the water users affected have successfully converted their revocable permits into leases. That process includes conducting environmental reviews, a watershed conservation plan, consulting with Native Hawaiians as to their potential water needs and, for many, bidding on the water at a public auction. The water also must be appraised. A&B and others hoped that the Legislature would extend this year’s deadline. Earlier this year the House moved House Bill 1326 over to the Senate, which would have extended it by seven years — which is the same length of time that A&B could be on the hook to pay Mahi Pono $62 million if a certain amount of water wasn’t accessible for its operations. The bill drew heated protest earlier this week when it was heard by the joint Senate committees with testimony lasting for nearly six hours. The committees reconvened Thursday to make a decision on the measure. Dela Cruz didn’t explain why he killed the bill, but his move elicited confusion and gasps from the people in the hearing room. Kahele’s proposed version of the bill, which would have excluded A&B, had just narrowly passed his Water and Land Committee. Kahele’s proposed amendments to House Bill 1326 had gained the support of the Office of Hawaiian Affairs earlier in the day when trustees voted in favor of it. “For far too long, our state has managed Hawai‘i’s water in favor of for-profit enterprises at the expense of our environment and the rights of Native Hawaiians and kalo farmers, including our beneficiaries in East Maui,” said OHA Chairwoman Colette Machado, OHA Maui trustee Hulu Lindsey and OHA Chief Executive Officer Kamana‘opono Crabbe in a joint statement issued prior to the hearing. Marti Townsend, executive director of the Hawaii Sierra Club, said after the hearing that it was disappointing that Kahele’s proposal didn’t pass. A&B spokesman Darren Pai said in a statement after the hearing that the company is “extremely disappointed” the bill didn’t pass and criticized opponents for focusing on A&B when others would be affected as well. Below is an update of our bill priorities as of second lateral, when bills must move to their final committee in their non-originating chamber. HB 1584 – [Support] Office of Planning to conduct a comprehensive study of a statewide carbon tax. WAM. HB 307 – [Oppose] Broadens the definition of "renewable energy" to include other self-replenishing non-fossil fuel resources. EET/CPH. HB 550 – [Support] Amends the definition of "renewable portfolio standard" to more accurately reflect the percentage of renewable energy use in the State. CPH/WAM. HB 556 – [Support] Establishes minimum appliance efficiency standards for certain products sold or installed in the State. Requires the public benefits fee administrator to educate and train appliance manufacturers, distributors, and retailers about the appliance efficiency standards. CPH. HB 549 – [Support] Requires new developments to plan for the impacts of projected sea level rise and prohibits development in areas significantly affected by projected sea level rise. Amends policies and objectives related to coastal zone management to reduce residential exposure to coastal hazards and protect state beaches and public shoreline access. Defines "beach" and "coastal hazards". JDC/WAM. HB 461 – [Support] Requires the Hawaii Climate Change Mitigation and Adaptation Commission to conduct certain activities to address the impacts of sea level rise and report to the Legislature before the 2021 Regular Session. Appropriates funds for the Commission's activities and to fund the Climate Change Mitigation and Adaptation Coordinator. WAM. HB 765 – [Support] Requires incorporation of sea level rise projections in all new plans and updates to existing state plans generated under the Hawaii State Planning Act. WAM. HB 1487 – [Support] Establishes the Honolulu shoreline climate protection pilot project to develop a plan to protect urban Honolulu from the impacts of sea level rise, floodwater, storms, and other impacts of a rapidly changing climate. Repeals on 6/30/2022. Appropriates funds. WAM. HB 1326 – [Oppose] Allows holdover permits for stream diversions to continue until 2026. WTL/WAM. HB 808 – [Support] Establishes an offense of knowingly capturing, taking, possessing, abusing, entangling, or killing a shark in state marine waters, along with penalties and fines. Expands the existing prohibition on knowingly capturing or killing a manta ray in state marine waters to apply to all rays and to also include knowingly taking, possessing, abusing, or entangling a ray. Provides certain exemptions. Effective 7/1/2050. JDC/WAM. HB 551 – [Support] Extends lapse date for funds appropriated to the University of Hawaii to conduct a comprehensive statewide study of sewage contamination in nearshore marine areas. Extends lapse date for funds appropriated to the Department of Health to conduct research or gather technical assistance relating to the cesspool conversion working group's comprehensive cesspool conversion plan. WAM. SCR 35 – [Support] Urging the U.S. EPA and the Hawaii Department of Health to reject the approval of a single wall tank upgrade alternative option for the Red Hill Bulk Fuel Storage Facility and the conclusions presented in the Groundwater Protection and Evaluations Considerations Report dated July 27, 2018. SB 696 – [Support] Extends various reporting deadlines and the sunset date of the cesspool conversion working group established pursuant to Act 132, Session Laws of Hawaii 2018. Extends the lapse dates for funds appropriated to conduct a comprehensive statewide study of sewage contamination in nearshore marine areas and for research and technical assistance necessary for completion of the comprehensive cesspool conversion plan. FIN. HB 593 – [Oppose] Authorizes the development of utility scale solar projects on class A agricultural lands, subject to certain requirements. Repeals 6/30/2025. WAM. HB 1403 - [Oppose] Requires approval of a permit application submitted by a housing development project that uses moneys from the rental housing revolving fund if a county does not issue a decision on the application within sixty days, subject to certain requirements. Exempts the foregoing projects from environmental impact statement requirements until an update to administrative rules regarding exemptions to environmental impact statement requirements takes effect. WAM. HCR 55 - [Support] Requesting the Governor to convene a working group to make recommendations on the consolidation of state environmental functions and the establishment of a Department of the Environment. FIN. HCR 198 - [Support] Requesting the Legislature to convene a working group to discuss the economic growth potential of investing in green industry initiatives. FIN. HB 762 – [Support] Prohibits providing straws unless requested. JDC. SCR 31 – [Support] Designating the Hawaii State Capitol building and its grounds as a single-use plastic free zone. WAM. SB 522 – [Support] Single-use Plastics Working Group. FIN. SB 893 – [Support] Prohibits counties with a population less than 500,000 from rejecting number 1 and 2 plastic bottles presented for recycling solely because the bottles are accompanied by or adjoined to nonrecyclable bottle caps. Requires and appropriates funds for the counties to separate and appropriately dispose of such nonrecyclable bottle caps. Requires the counties to include a feasibility assessment of recycling PP materials. FIN. HB 1217 – [Support] Automatic Voter Registration for driver's license and identification card applications. JDC. HB 1485 – [Support] Establishes a process for automatically preregistering or registering public school-enrolled students who are at least 16 years old. SB 412 – [Support] Automatic Voter Registration for driver's license and identification card applications. FIN. SB 390 – [Support] Department of Agriculture to create a dollar-for-dollar match program for beneficiaries of the federal Supplemental Nutrition Assistance Program who purchase Hawaii-grown produce. FIN. ACT NOW TO #FREETHESTREAMS! HB 1326 HD2 IS VOTED ON IN THE HOUSE FINANCE COMMITTEE ON WEDNESDAY, 2/27 at 11:30AM. The last committee changed the “unlimited” timeline to 7 years—but that is not enough. The corporate water diverters have already received an extra 3 year extension in 2016 to finish environmental impact statements that were required 15 years ago and completing the long term lease application. CALL NOW Representative Luke and the members of the Finance Committee and ask them to vote NO on HB1326. HB1326 was heard in the Finance committee last week. Call and email the committee and ask them to VOTE NO on HB1326. Vice Chair: Cullen, Ty J.K.
HB1326 gives water diverters—like A&B (now Mahi Pono) and KIUC—an UNLIMITED amount of water, for an INDEFINITE amount of time, for UNKNOWN uses. This bill provides no standards or criteria for ensuring that stream ecosystems are protected from excessive water diversions. A&B is asking lawmakers to pass HB1326—because they promised in its sale agreement with Mahi Pono that the state would give them 30 million gallons of water a day—or else A&B will have to pay Mahi Pono $62 million. But it will impact more than just East Maui. This bill would also extend temporary water permits held by others, like Kauaʻi Island Utility Cooperative for diverting sacred waters of Waiʻaleʻale and Waikoko. Lawmakers are often quick to criticize DLNR for mismanagement but then turnaround and support bills like this that ensure the mismanagement could only get worse. There is no criteria or oversight written into this bill that protects streams, its native ecosystems, or the communities that depend on them for basic necessities. There are bills in front of the legislature that set a good example of how things should be done. Bills like HB848—that provide for the protection of stream resources, while allowing stream diversions for diversified agriculture so long as it does not harm the health of the streams. However, HB848 has yet to get scheduled for a hearing. There is enough water for everyone to prosper, it is just a matter of striking the right balance. HB1326 is basically a blank check to Mahi Pono, A&B, KIUC and others to continue the unjust practice of taking unlimited amounts of water from Hawaiʻi’s streams—to the detriment of our native ecosystems and the people that depend on them. E ola i kai wai!! Water is life!! HB1326 WAS HEARD AND PASSED OUT OF WLH WITH A 5-TO-1 VOTE ON FEB 8. Mahalo nui to EVERYONE who submitted testimony in opposition to this terrible bill. There were over 600 testimonies submitted, most in opposition, with over a dozen verbal testimonies provided at the hearing. The bill was amended from providing diverters the ability to take water for an indefinite about of time to seven years, including authorization to continue diverting while permits are challenged in court. Voting for the bill were: Committee Chairperson Ryan Yamane from Mililani, Vice Chair Chris Todd, and members Rep. Nicole Lowen, and Rep. David Tarnas, all from the Big Island, and Rep. Sharon Har, representing Kapolei. Rep. Thielen from Kailua/Kaneohe was absent and excused. Rep. Tina Wildberger from Maui was the sole no vote. Advocates stand with Rep. Tina Wildberger, South Maui District 11 Representative, after the hearing for hb 1326. Rep. Wildberger was the only Committee member to vote “no” on allowing unrestricted stream diversions to continue for another seven years. HONOLULU, HAWAIʻI (February 11, 2019) -- Friday, the House Committee on Water, Land, and Hawaiian Affairs voted 5-to-1 in support of HB1326, which seeks to expand the temporary water diversion permits that were the source of immense controversy in 2016. More than 600 people submitted written testimony, most in opposition, and more than a dozen people testified in person against the bill. Many of these testifiers were from Kauaʻi and Maui, and suffer direct harm from the excessive diversion of streams in their communities. 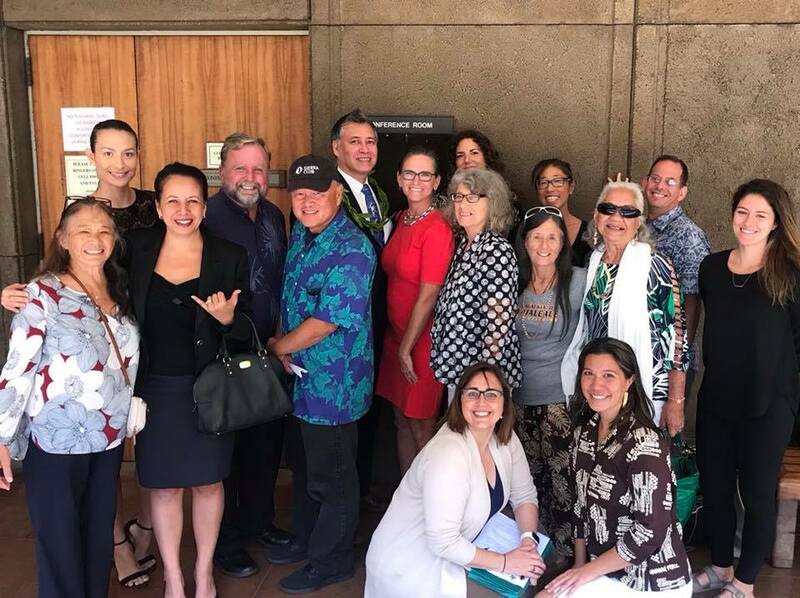 Also testifying in opposition were the Environmental Caucus of the Democratic Party, Council for Native Hawaiian Advancement, Office of Hawaiian Affairs, Earthjustice, Native Hawaiian Legal Corporation, Hawaiʻi Alliance for Progressive Action, Sierra Club, KAHEA: The Hawaiian-Environmental Alliance, and Young Progressives Demanding Action. HB1326 proposed to give diverters unlimited, unconditional permission to divert stream water indefinitely. It was amended to reduce the time frame for unlimited diversions to 7 years, including authorization to continue diverting while permits are challenged in court. Testifying in support of the excessive stream diversions were major corporations and their supporters such as Mahi Pono (the new owner of A&B land in Central Maui), Grove Farms, the Hawaiʻi Crop Improvement Association, Land Use Research Foundation, Hawaiʻi Agriculture Research Corporation, and several chambers of commerce. There were no constituents at the hearing from the Big Island. Former Lt. Governor-turned lobbyist, Shan Tsutsui testified on behalf of Mahi Pono in support of the bill. When asked if Mahi Pono could support limitations on future stream diversions, Tsutsui did not commit. He only promised to read other bills, like HB848, that seek to share stream water more fairly. Kauaʻi Island Utility Co-op and Grove Farms did not testify in person at the hearing. KIUC diverts nearly all of Waiʻaleʻale stream for hydropower plants that produce 1% of the energy used on Kauaʻi before sending it to Grove Farms, who sells the water back to the county. They have been diverting water on month-to-month permits for 15 years. No Environmental Impact Statement has been completed. Several small farmers and ranchers also submitted testimony in support of the bill out of fear that current diversified agricultural efforts might be harmed by reduced stream diversions.